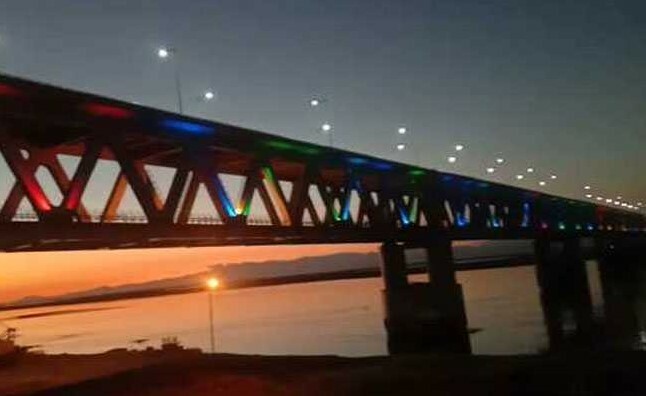 Bogibeel Bridge: Narendra Modi Inaugurates Country Longest Rail Road Bridge On Brahmapurta River In Assam: Prime Minister Narendra Modi inaugurated the country's longest railway-road bridge Bogibeel in Dibrugarh in Assam this afternoon. It will connect Brahmaputra river north and south coast. The bridge length is 4.94 km. According to an officer, the government is celebrating Good Governance Day on 25th December. On this occasion, the prime minister gave the people of the country to the bridge. The military tank can pass by bridge Fighter aircraft can also land on the bridge if needed. In 2002, the Atal Bihari Vajpayee Government started its construction. The total cost of the bridge was Rs. 5920 crores. An amazing specimen of Bogibeel bridge engineering is being told. It will link Dhamaji district of Arunachal from Dibrugarh in Assam. This will reduce the distance between Dibrugarh of Arunachal to Dibrugarh of Assam by 700 kilometers to about 180 km. The time required for this journey will be reduced by 19 hours. Northeast Frontier Railway, It was challenging to build a bridge at the Brahmaputra river, there is more rain in this area, due to the presence of seismic zone, there is a danger of an earthquake. The bridge is designed especially such a ways that it can survive any climate and condition. Bogibeel is Asia's second longest railway-road bridge. The lifespan of the bridge is said to be 120 years. Three million cement bags were used to build the bridge. At the same time, 12 thousand 250 meters of iron (doubled from the height of Mount Everest) was used to build the bridge.